Buried at KANCHANABURI WAR CEMETERY, Thailand. 2. E. 44. Aged 35. Son of Amos Catchpole and of Maria Catchpole, of Brandon, Suffolk. Bert’s birth was registered in Thetford in the spring of 1908. According to the 1911 census his father Amos was a general labour and his mother Maria was bringing up a family with five children – Gertie (14), Florence (12), Frederick (7), William (5) and Bertie (2). The family were living at 7 Star Lane, Thetford, although the family had lived in Brandon prior to the census. They had moved back to Brandon when Bert’s father, Amos, enlisted into the army for WW1. He was already a middle aged man at the time. 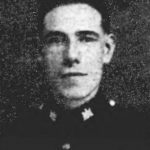 Upon his return Amos became disillusioned with the town and was one of the ring leaders of the riot that took place in Brandon in 1919. Bert, like his father, went to war as a middle aged man. At the time he was best remembered as being seen in Brandon wearing the uniform of the Salvation Army. However, in 1939, with the real threat of a German invasion looming, he enlisted as a Territorial with the 4th Battalion of the Suffolk Regiment. His aim was to defend this nation from invasion. For a couple of years Bert remained on UK soil, manning beach defences, training in warfare or even helping farmers with the harvest. When the threat of invasion diminished then the Territorials were directed to enter into the theatre of war. For Bert and the Suffolks this was North Africa and Egypt. However as the Territorials were on the sea events took a turn in December 1941, when the Japanese bombed Pearl Harbor. Singapore now looked vulnerable, so the Territorials were diverted there. In February 1942 they landed with few weapons and within weeks had surrendered to the Japanese. Bert was destined to spend the rest of his life as a prisoner of the Japanese. Singapore was wracked in chaos and news slowly filtered out. There was no word about the fate of individual soldiers, who were listed as “missing”. Bert’s family knew nothing of his welfare. Was he dead? Was he a prisoner? Or had he somehow escaped? Then the following year, in July 1943, they were officially notified he was a prisoner of the Japanese. This news would give them hope, but sadly just three months later Bert succumbed to disease and died. He had spent 20 months as a prisoner. Bert’s father died in May 1945. The following year, in May 1946, Bert’s mother, Maria, received the contents of Bert’s will – £133 7s 8d. Bert’s address was listed in the will as being 200 London Road, Brandon.